The following information is for all those concerned with the donation which will be made to a breast cancer organization or charity by us (on behalf of our customer) for purchase of our breast cancer cause line of clothing, Win the Battle! If, while making your purchase, you select "Let The Motto Shop Choose", we will make the decision as to which organization/charity receives the proceeds. If, while making your purchase, you select "I Will Notify The Motto Shop", we will send you an e-mail requesting you to inform us of the recipient organization/charity and they must have a way for us to contribute such funds via the Internet or electronically. You must reply within seven (7) days or we will choose the recipient. The organizations we have listed for buyers to select to receive a portion of the proceeds from their purchase were selected primarily based on the information we received from reliable resources who monitor how well charitable organizations utilize donations. We are not endorsing nor recommending any of these organizations and we recommend our customers take the time to discover more about any organization for which they are not familiar or if they have specific questions they wish to have answered. We pay none of these organizations to list their names as is found along with the product or as may be found at The Motto Shop or our other associated sites or media. 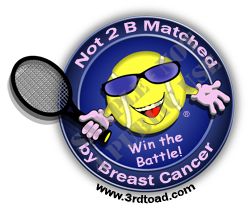 No breast cancer organization/charity pays us to list or display them on The Motto Shop or our other associated sites or media, although certain ones (not listed) have virtually demanded such. We may participate in reciprocal advertising with an organization/charity and/or allow them to convey messages on one of our associated sites or media, but this does not constitute an endorsement or recommendation by us. Our contributions are either made weekly or on no-less than a quarterly basis until we find the best periodicity based upon the recipient, accounting and you know who - those guys in our state capitol and up in D.C.
With all that being said, we appreciate all who purchase our Win the Battle! line of apparel and accessories. We will continue to offer these products as long as the cause exists. We welcome any and all input, experiences and stories regarding breast cancer and you can do so most anywhere here on our blog or simply go to Speak Up! Win the Battle! or Help a Victim Do So!